With 30 years of tree care experience, and Certified Arborists, Certified Tree Inspectors and Certified Pesticide Applicators on staff, Pioneer Tree Service is a full service professional tree care company that offers quality tree trimming and removal services in the Oak Grove, MN area. It is safest to trim oak trees and elm trees during the colder fall and winter months. Trimming your oak trees in the winter months reduces the likelihood of spreading Oak Wilt and other diseases. 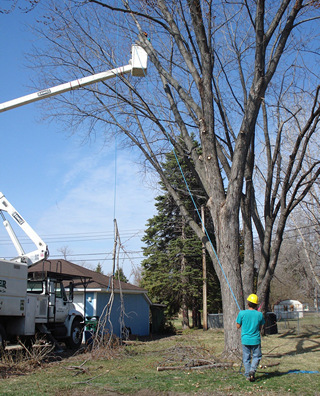 Pioneer Tree Service provides winter tree trimming services for oak and elm trees, call (763) 238-5254 to schedule an appointment for your Oak Grove property. Pioneer Tree Service has clean, dry Red Oak firewood available for your fireplace or wood burning furnace. Call (763) 238-5254 to schedule a delivery to your Oak Grove area home. Split fine. 4'x 8'x 16" face cord $125 (residential fireplace cord) or 2-full-cord load delivered for $550. Hurry - get your firewood before the cold January and February nights!